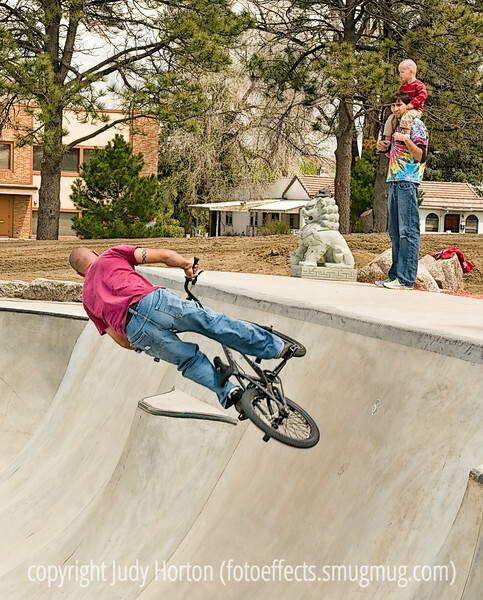 Tricks at the Park - I took this shot at the Colorado Springs Skateboarding Park, where kids and young men were both skateboarding and cycling up, down, and around the course. This young man was one of the best cyclists at doing the athletic tricks. Hope your week begins well. Wow! Great timing and a great composition. Fine work, as always! WOW! Very good action shot. Nice shot with the father and son watching ! Judy, I love these. I would hope the guys on the bikes and boards would see the value of buying a photo or two. If you guys are reading this, I am telling you this is good stuff so buy something (she has them extremely underpriced)! Soon you will get "barely too old" like me and won't be able to do this anymore. Excellent action capture! Somethng I been wanting to do more of.